Cashner has bounced back nicely from getting rocked in his first start of the season giving up six runs. Since then Cashner is 3-0 over four starts with a 3.38 ERA and 1.36 WHIP. The veteran righty is worth a pickup in deeper fantasy leagues as well as AL-only formats. Andrew Cashner beat the Red Sox on Saturday after allowing three runs in five innings of work. Cashner walked three batters while striking out two. Cashner has three wins in his first four starts but the rest of his numbers aren't looking so good. The veteran starter has a 5.31ERA, 1.62WHIP and just nine strikeouts over 20 1/3 innings pitched. Cashner should be avoided in fantasy leagues. Andrew Cashner (2-1) gave up three earned runs with one walk while striking out one through 5 1/3 innings in a win over the Athletics on Monday. Cashner has two wins on the season but his numbers aren't that great. The veteran righty has a 5.28 ERA, 1.78 WHIP and has given up three home runs in 15 1/3 innings. Cashner will have a tough assignment in his next start when he faces the Red Sox in Boston. Andrew Cashner (1-1) earned his first win of the season by allowing only four hits across six scoreless innings against the Blue Jays on Tuesday. He struck out three and issued three walks. Cashner was able to bounce back from Opening Day when he gave up six runs to the Yankees. The veteran righty was 4-15 last season with a 5.29 ERA and 1.58 WHIP which makes him risky to pick up in fantasy. 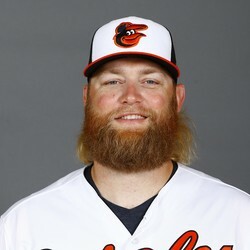 Cashner currently lines up to start against the Athletics next Monday. Cashner struggled mightily in his Opening Day assignment against a tough Yankees lineup. The veteran pitcher is no longer fantasy relevant and can be left on the waiver wire.